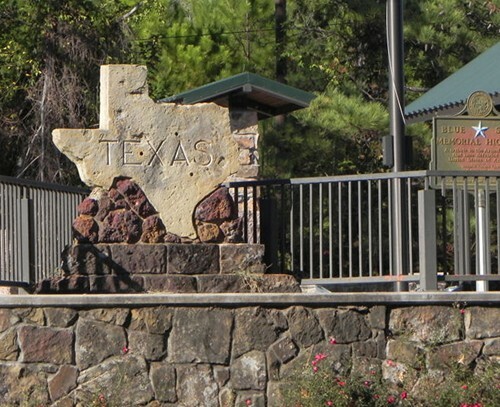 Sabine County, one of the original 23 Texas counties, is on the eastern border of Texas. It is bound by and named for the Sabine River, which separates the state from Louisiana. Originally, the Ais tribe of the Caddo Indians lived in the area. By the early 1700s, Spanish explorers passed through the county. 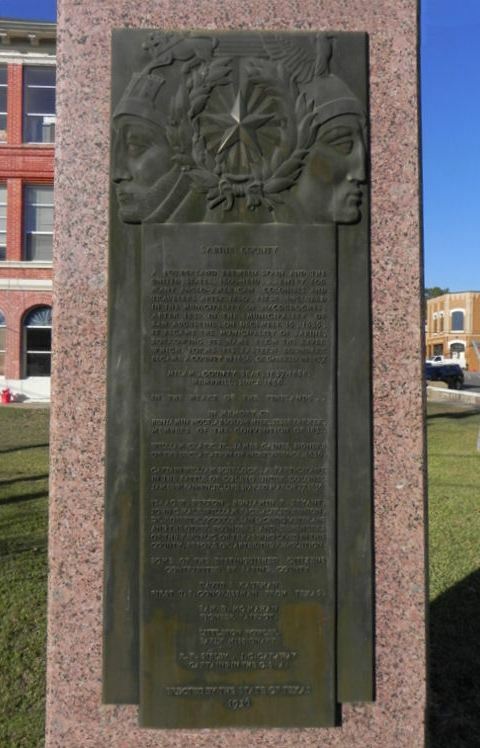 By 1825, the Mexican government had established the district of Sabine, which became an entry point for U.S. Settlers immigrating into Texas, including Stephen F. Austin. 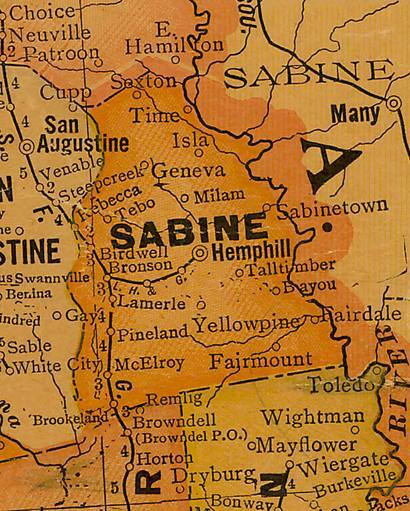 In 1837, after the War for Texas Independence, the new government formed Sabine County. 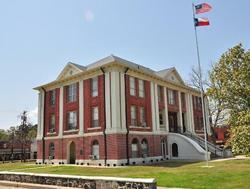 Milam served as the county seat until 1858, when Hemphill was established for that role as a more centrally located community. Timber harvesting and production has been the primary industry in heavily-forested Sabine County since around 1880. At that time, logs were floated down the Sabine River to large saw mills in Orange County. The railroads also had a major economic impact beginning in 1903, when the Gulf, Beaumont & Great Northern Railroad Company began operation of a railway segment in Sabine County. The population steadily increased until the Great Depression, which had a long-lasting effect on the area. 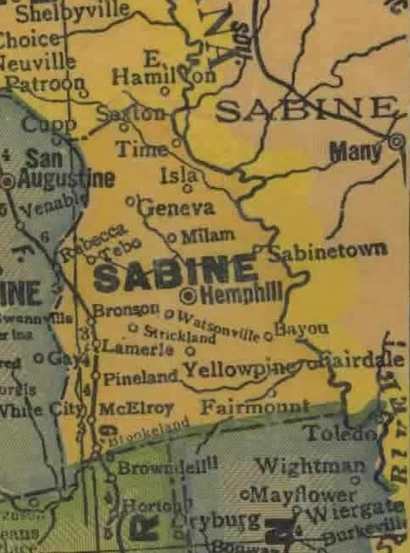 Sabine County was without banking service from 1933 until 1944. Many families moved from the county to search for jobs, leading to steep decline in population. In the 1960s, work began on the Toledo Bend Reservoir, one of the largest man-made lakes in the U.S. Completion of the reservoir in the late 1960s led to a boost in the county’s population. 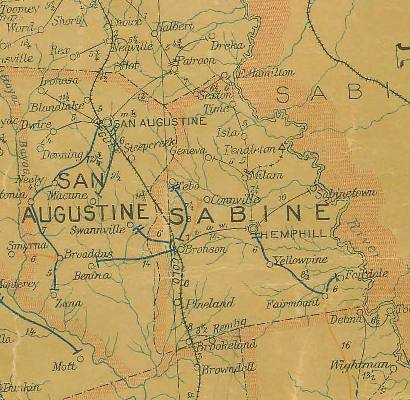 In 2010, approximately 10,000 residents lived in historic Sabine County.